Cork flooring is enjoying a strong resurgence as more people begin to appreciate the distinctive look, feel and the durability of the material. Natural cork products are made from the renewable bark of the cork oak tree. These trees grow primarily in Portugal, Spain, and Tunisia. The cork is harvested approximately every nine years and amazingly, the cork bark grows back with no real harm to the tree. Cork flooring is made by grinding up the bark into small pieces then forming them into large blocks after a non-toxic* resin binder is applied.The blocks are sliced into sheets that are either 5mm or 8 mm thick. The color of cork varies from a tan to a dark walnut depending on how long it was baked during manufacturing. Most cork manufacturers recommend using polyurethane adhesive but some recommend using DriTac, a water based, low-VOC latex adhesive, which should work just fine for any cork flooring. After installation, the floor tiles are coated with either a polyurethane finish or a natural wax treatment. A water based, low VOC polyurethane can be used for coating as well and is a better environmental choice. Cork flooring provides acoustical and thermal insulation, it is cushiony, resistant to moisture damage and decay, easy to clean, definitely has some eye appeal, and it’s anti-allergenic and anti-static. It does have a couple of drawbacks. As with any wood product, water can damage it, so it should not be installed in basements which may be subject to seepage or flooding.It is soft, so furniture pads are recommended to prevent denting. Cork is imported, so the energy used during transportation and shipping costs are a consideration. Cork is somewhat expensive, although a it does not appear to be more expensive than linoleum tiles. 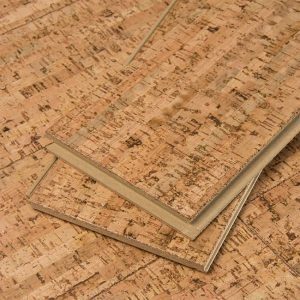 Cork flooring is durable, attractive and easy to install. AsktheBuilder.com host Tim Carter shows how to install a cork floor. His tips and instructions make laying cork floor tiles easy.